In the 1950's, on Washington Street at Market, directly opposite Bamberger's Department Store *, there was a unique retail business, Housecraft Inc. It sold only one item - sewing machines - and its three floor operation made it the largest of its kind in the United States. A housewife who bought a new sewing machine at Housecraft received with it a free sewing or dressmaking course, given on the store's premises by skilled instructors. How Housecraft got to that Downtown Newark location and that size of operation is a story in itself. The business had originally started in the late 1940's in a 16-foot wide storefront on Broad Street in Downtown Newark directly opposite Newark City Hall. The store owner, Sam Green, picked up old sewing machine heads, mainly Singers, and reconditioned and electrified them and sold them in new wood cabinets in the store. All of the selling was done by his wife, Sylvia, who had acquired sales and marketing skills in earlier employment with a Newark appliance distributor. One day, the store had an out-of-town visitor who turned their life around. His name was Leon Jolson. He told the Greens he was a Holocaust survivor who in the pre-Hitler era had been a member of a prosperous European business family that had had extensive dealings with the Necchi Company in Pavia, Italy, before the War. The company was then famous for its manufacture of armaments. Now, Jolson, newly settled in America, had re-connected with the Necchi Company, which now made a sewing machine that was vastly superior to the leading American make, Singer -- and the Necchi Company had given Jolson and his recently-formed company exclusive marketing rights to the Necchi sewing machine n the United States of America. Jolson told the Greens he was traveling from city to city with a sample Necchi machine and signing up dealers on an exclusive basis. The Greens, Sylvia and Sam, were so impressed with the Necchi that Jolson had brought with him, that they eventually signed for exclusive Essex and Union County sales rights in exchange for which they committed themselves to buy a minimum of more that 100 new Necchi sewing machine heads every month. This was a considerable gamble for the Greens, considering they had never, before the contract signing, sold a single new sewing machine of any make. With considerable advertising and promotion in newspapers, in telephone directories, and on a new local television channel, Channel 13, in the Mosque Theatre Building on Broad Street, they gradually built the business up to be one of the most active stores of its type in the country. The Necchi Company, with headquarters in New York City, considered Housecraft Inc. in Downtown Newark their premier dealer and copies of Housecraft's Necchi newspaper ads in the Star-Ledger, were sent as samples of good Necchi advertising to Necchi dealers throughout the country. Through a stroke of good fortune, not too long after Housecraft committed itself to the Necchi franchise, Consumers Union came out with its ratings for sewing machines and named the Necchi as the No. 1 Best Buy. Sales success for Housecraft, after the Consumers Union happening, seemed virtually assured and the operation grew with a huge staff that included store and field sales personnel, teachers for their school, and technical personnel to assemble and prepare machines for sale. Also a branch store was opened in downtown Elizabeth. Additional sewing machine lines were added, including one from Japan that Housecraft sold under its own brand name. Eventually, the Singer people were so impressed with that Japanese machine that, rather than compete with it, they bought the company and put their own name on the machine. After many years of success as one of the nation's top sewing machine operations, facing the prospect of a new long-term lease, the Greens decided, after a virtual seven-days-a-week business operation, to take some time off and enjoy their senior years. They closed down the business after a lengthy clearance sale to dispose of stock on hand. 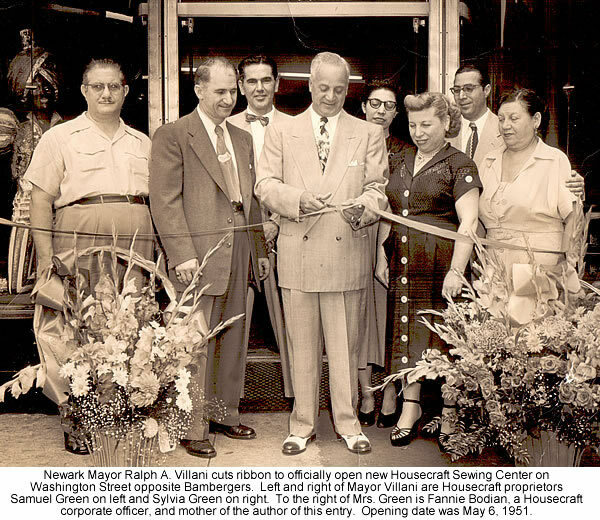 As with many other successful Downtown Newark business operations, Housecraft Inc. had had its "15 minutes in the sun" which lasted about 15 years. Its owners eventually turned to real estate investment. I lived through and was involved in virtually every heartbeat of the Housecraft Inc. experience. Sylvia Green was my sister, and I created all of her advertising and publicity. * In 1921, the Housecraft site was occupied by Lewitts Department Drugstore. The owners used the store's grand opening on July 2 to have the Carpentier-Dempsey fight professionally announced at the flag bedecked store site. A crowd of 30,000 filled the walks and curbs at the intersection of Market and Washington Streets to hear the fight. Dempsey won....In the post World War 2 era the Washington Street entrances of Housecraft would face the L. Bamberger & Co. marquee where Santa Claus would alight from his sleigh to enter the department store at the end of the traditional Bamberger Thanksgiving Day parade.